Tottenham Green is a small green area right outside the Bernie Grant Arts Centre (see other article), just a five minute walk from Seven Sisters underground towards Bruce Grove. Every Sunday, the Green comes alive with a tiny market offering food, drink and fresh produce. Though the stalls themselves change week to week, there are some that crop up time and again and never fail to impress. One of my favourites is the Greek Souvlaiki stall – serving freshly grilled meat served with a selection of bright salads and chips drizzled with yoghurt and chilli sauce – my mouth is watering just imagining it. 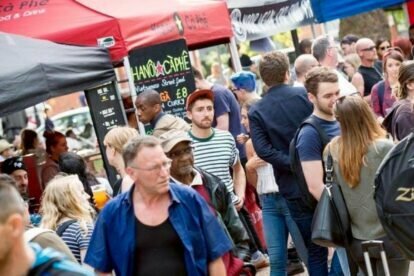 There are also a number of stalls serving food to take home – from homemade ravioli to honey to sourdough to locally brewed craft beer to vegan pies. When you’ve exhausted the market/yourselves I recommend taking the short walk to the Beehive (check my article) for a restorative pint.